Calendula, marigold, is a genus of about 12-20 species of annual or perennial herbaceous plants in the daisy family Asteraceae, native to an area from Macaronesia east through the Mediterranean to Iran. Calendula should not be confused with other plants that are also known as marigolds, such as corn marigold, desert marigold, marsh marigold, or plants of the genus Tagetes. The name "calendula" is a modern Latin diminutive of calendae, meaning "little calendar", "little clock" or possibly "little weather-glass". 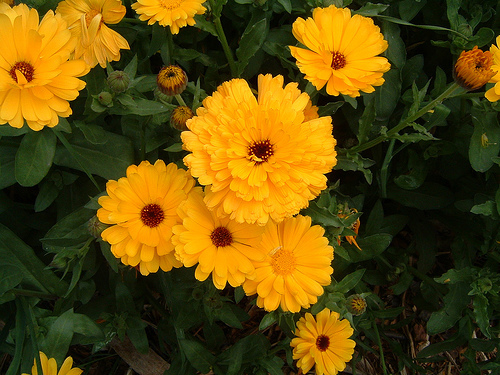 The common name "marigold" possibly refers to the Virgin Mary. Claims that its old Saxon or Anglo-Saxon name is 'ymbglidegold' are unsubstantiated, as is the claim that this means 'it turns with the sun'. Agriculture in Israel is a highly developed industry: Israel is a major exporter of fresh produce and a world-leader in agricultural technologies despite the fact that the geography of Israel is not naturally conducive to agriculture. More than half of the land area is desert, and the climate and lack of water resources do not favor farming. Only 20% of the land area is naturally arable. Farm fresh grower-direct flowers from following varieties: echinops, rose spray, leucospermum, tanacetum, globularia, trachelium, alstroemeria, lilium, crocosmia, dianthus, gypsophila, ranunculus, achillea, phlox, gomphrena, roses tea, tulip, veronica, eremurus, carthamus, capsicum, lisianthus, limonium, matthiola, narcissus, gerbera, delphinium, gladiolus, eustoma, celosia, solidago, craspedia, gerbera standard, sunflower, anemone, paeonia, agapanthus, desert yearning, hippeastrum, ornithogalum, godetia, astilbe, calla, roses, anigozanthos, bouvardia, prothea, kangaroo paw, cotton, ixia, campanula, roses small head, freesia, aster, gypso, grevillea, aconitum, chrysanthemum, curcuma, kniphofia, iris, strelitzia, gerbera mini, ozothamnus, banksia, green bell, wax flower, asclepias, moluccella, matricaria, liatris, statice, antirrhinum, etc. 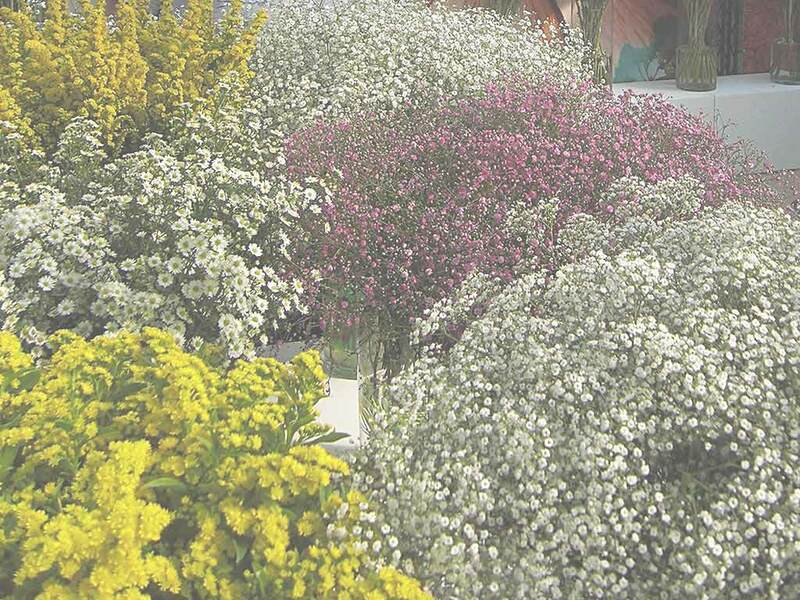 Fresh cut foliage of the following varieties: cotton, myrsine, murraya, euphorbia, photinia, viburnum, aralia, prunus, agonis, cyperus, ruscus, chondropetalum, aspidistra, kochia, myrtus, croton, artichoke, melaleuca, adenanthos, hypericum, eucalyptus, cycas, myrica, euonymus, monstera, rotem, leucadendron, fern, hedera, bear grass, grevillea, acacia, rhamnus, pittosporum, steel grass, philodendron, cyrtomium, palm, salix, hibiscus, asparagus, cocculus, etc. Fresh herbs and lettuce salads from leading Israeli growers: rucola deluxe, rosemary, mint, sage, chervil, tatsoi, tarragon, marjoram, spinach, oregano, savory, parsley flat, thyme, marjoram sweet, rucola, lemongrass, salicornia, arugula, lemon grass, lemon balm, mizuna, sorrel, baby mix salad, arugula deluxe, basil red, dill, parsley curly, lollo rosso lettuce, chives, arugula baby, romaine lettuce, red chard, basil, baby spring mix lettuce, rucola baby, coriander, bulls blood, basil green, peppermint, etc. Used as spices and seasoning herbs herb in recipes of healthy food cooking. All year long best price fresh herb and salad wholesaler supplies. Our produce can be delivered worldwide by air cargo carriers to the following international destinations: Azerbaijan, China, Spain, Gibraltar, Japan, Australia, South Korea, Andorra, Kazakhstan, Vietnam, United Kingdom, Belarus, Cyprus, USA, Slovakia, Kazakhstan, Greece, Turkey, Kyrgyzstan, Denmark, Uruguay, United States, Portugal, CIS countries, Republic of Ireland, Costa Rica, Philippines, Colombia, Argentina, Czech Republic, Bolivia, Lithuania, Uzbekistan, Armenia, Germany, Malaysia, Georgia, Poland, Norway, New Zealand, Finland, Peru, Taiwan, Latvia, Estonia, Ukraine, Slovenia, Switzerland, Netherlands, Singapore, France, Tajikistan, South Africa, Ukraine, Sri Lanka, Italy, Iceland, Brazil, UK, Romania, Mexico, Ecuador, Holland, Bosnia, Canada, Belgium, Monaco, Russia, Belarus, India, Turkmenistan, Panama, Croatia, Bulgaria, Thailand, Macedonia, Chile, Nicaragua, Liechtenstein, Indonesia, Venezuela, Malta, Hungary, Sweden, Laos, Austria, Hong Kong, Paraguay, Luxembourg, Moldova, etc.